BSC Designer provides various visualization and reporting means. 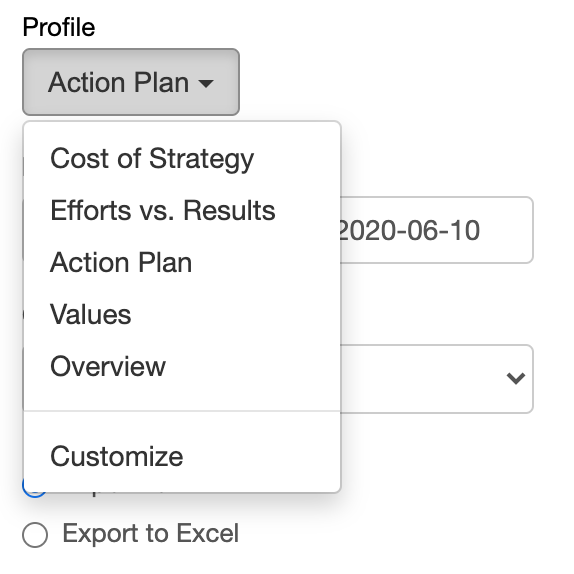 Customize - use this option to create your own reports. 3. Follow the link to open a generated report. Any HTML report can be converted into an Adobe PDF document using any of free PDF printers available. 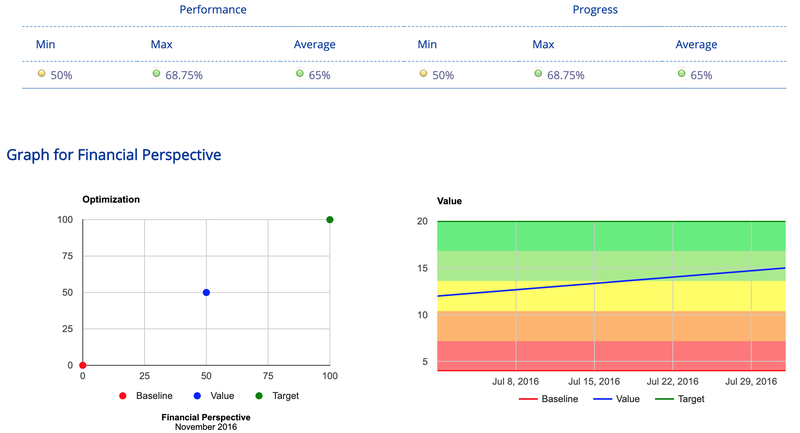 To access charts and diagrams in BSC Designer Online open a scorecard, go to the KPIs tab and select any container or indicator. The chart element is displayed on the right. Besides having a chart you have several drop lists. BSC Designer Online supports several types of chart. Time chart. The chart shows how the value of the KPI changes over the time. On the chart, the baseline and target values are displayed as well. Gauge diagram. Displays the values of the KPI for the date selected in the calendar. The baseline and target values are displayed as well. Optimization. Refers to the formula that is used to calculate the performance. Performance and Progress. These charts show how the performance and progress value for the selected KPI are changing over a period of time. Pie. A Pie diagram is useful when you need to compare the performance of several KPIs in one container or in several top container. Values. Values table shows a date and respective KPI value for these dates. Weight. This chart shows weights of all KPIs within a selected container.